Non-adhesive window film - Where can I get a non-adhesive window film that looks like the one used on the door ? Gila films are great for DIY but if you want a static cling installation visit www.solyxfilms.com for lots of decorative options. You could always contact your local window film experts as well! I love the light fixture-where can I buy it? Where can I buy he settee? Where did you buy the pendant light??? Wall color paint - What is the color on the walls here? Light Fixture - Love the light fixture. Where is it from? Beautiful bathroom! Love the Roman Shades! Can you share more info about these? shades - where can I buy this type of shade? these are beautiful and I love the valance over it. can you please tell me where the light fixture is from? thanks. The dream bath: Classic designer luxuryThe translation: Even without the massive square footage or fancy designer, you can pull together a gorgeous room with classic, crisp decorator touches that are well within reach. 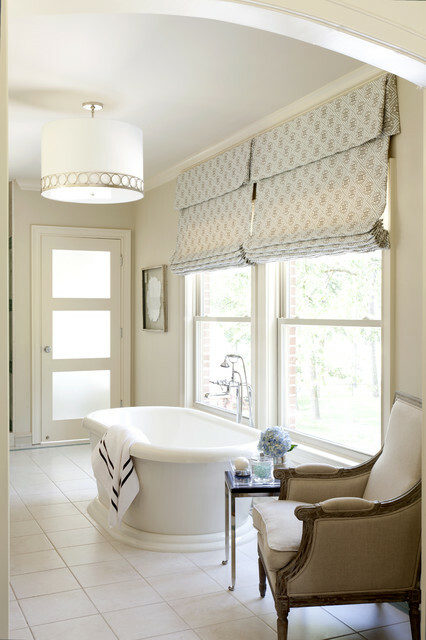 • Swap out standard blinds for fabric shades and your bath will suddenly feel like a real room.• Upgrade your towels for a fluffy version with contrasting piping or grosgrain trim.• Want to let in more light? Try adhesive window films for more sun without sacrificing privacy.• Replace the standard ceiling fixture with a classic drum pendant light on a dimmer switch.• Add a piece of real furniture. An armchair (if you have the room) or a small gleaming wood or marble table is a good choice for the classic bath. In bigger bathrooms, such as this one, window films can be used on glass doors for privacy or on big windows for light-filled baths. While a pair might be nice, it's certainly not mandatory. A single bergère functions perfectly in a smaller space like this beautiful bath.